Damien Hirst (1965, Bristol, UK) is a leading artist of the YBA (Young British Artist) generation. He is widely regarded as one of the most important artists working today, creating highly iconic artworks. His art draws upon themes including life, death, love, loyalty and betrayal. The artist explores these concepts through a wide-ranging practice that includes installation, sculpture, painting and drawing, and his works often challenge the boundaries that exist between art, science and popular culture. Hirst conceived of the now famous Freeze exhibition in 1988. Presented in a dilapidated London warehouse, the exhibition displayed his own works along with those of his friends from Goldsmiths College including Tracey Emin, Sarah Lucas and Mat Collishaw. Rumour has it that Hirst sent a taxi to Charles Saatchi’s house to cajole him into attending the exhibition — a tactic that paid off with Saatchi collecting and championing many of the YBA artists. Hirst’s most recognisable body of works is the 'Natural History' series, where he presents animals suspended in formaldehyde in glass vitrines; The Physical Impossibility of Death in the Mind of Someone Living (1991) uses a shark which aggressively stares out at the viewer, whilst Mother and Child Divided (1993) is a four-part sculpture that uses a bisected cow and calf. The works raise questions concerning the fragility of our existence. The artist’s paintings are also renowned, with recognisable motifs including butterflies, spots and spun paint. 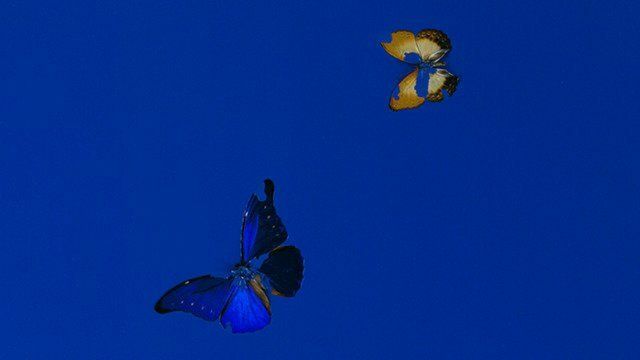 The concept of the ‘Butterfly Paintings’ derived from Hirst’s first solo show In and Out of Love, 1991. The exhibition covered two floors; upstairs, pupae were attached to white paintings, with the butterflies actually hatching during the opening, and downstairs, whole dead butterflies were scattered over colourful canvases. 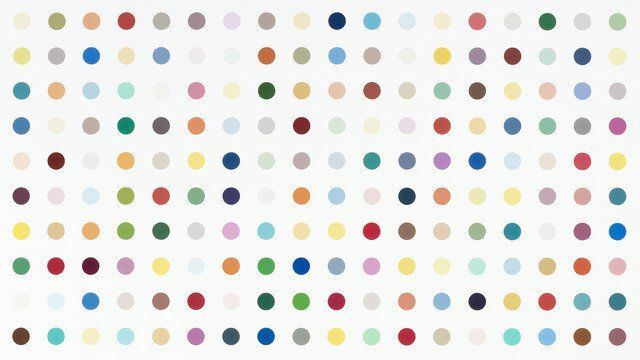 In September 2008, during the global banking crisis and on the same day that Lehman Brothers crashed, Hirst became the first artist to sell a complete show via the auction house Sotheby’s. Exceeding all expectations, Beautiful Inside My Head Forever raised a staggering £111 million. Damien Hirst’s solo exhibitions include the major retrospective Damien Hirst, Tate Modern, London, 2012; Internal Affairs, ICA London, 1991; Astrup Fearnley Museum Oslo, 1997; The Agony and the Ecstasy, Museo Archeologico Nazionale, Naples, 2004; Museum of Fine Arts Boston 2005; For the Love of God, Rijksmuseum, Amsterdam, 2008 and Palazzo Vecchio, Florence, 2010/1. He has participated in numerous group exhibitions including the Venice Biennale in 1993 and 2003; Twentieth Century British Sculpture, Jeu de Paume, Paris, 1996; Extreme Abstraction, Albright Knox Art Gallery, Buffalo, 2005; Into Me / Out of Me, P.S.1 Contemporary Art Center, New York, 2006; Re-Object, Kunsthaus Bregenz, 2007 and Color Chart: Reinventing Color 1950 to Today, Museum of Modern Art, New York, 2008. Receiving the DAAD fellowship in Berlin in 1994, he also won the Turner Prize in 1995.